What causes spinal cord tumors in children? When we think of the spine, or backbone, we generally think of it as the part of the skeleton that enables us to stand upright and walk. However, the bones that hold us upright have a second, and potentially even more important, responsibility: protecting a delicate column of nerve tissues that carry messages between the body and the brain. These messages between body and brain are what enables our body to function normally. Put simply, a spinal cord tumor is an abnormal growth of nerve cells inside the spinal column. For most people, however, the more important question is: what causes the nerve cells in the spinal cord to grow abnormally into a tumor? On-going research indicates that most spinal cord tumors are probably caused by mutations—or changes—to the genetic structure of the nerve cells. Certain mutations occurring within the genes that control cell growth can cause the mutated cells to grow abnormally. If the mutations occur in oncogenes, cells may grow and/or replicate too rapidly, while if the mutations occur in tumor suppressor genes, cells may not die at the right time; in both cases, the result is a clump of abnormal cells that will, eventually, become a tumor. But what causes these gene mutations? In the vast majority of cases, scientists simply do not know why these gene mutations occur. In a limited number of cases, the mutation may be inherited from one or both parents; in most cases, however, the mutation is random—an unfortunate accident that occurs during the natural lifecycle of the cell—and cannot be prevented or predicted. There are very few risk factors and no known lifestyle choices that impact a child’s risk of developing a spinal cord tumor. Are there any risk factors related to spinal cord tumors? The only other known risk factor for spinal cord tumors (and brain tumors) is exposure to radiation. In children, the danger of radiation is especially acute because the delicate cells of the central nervous system, including the spinal cord, are growing and replicating especially quickly. Today, physicians understand the unique dangers of radiation exposure in children and care is taken to minimize exposure, for example utilizing radiation-based scans such as x-rays only when necessary. In addition to radiation-based imaging technology, radiation can be a valuable and highly-effective tool to help fight other types of cancers. When battling childhood cancers, oncologists must weigh the potential benefits of radiation therapy with the risk of developing radiation-induced spinal cord tumors. For children under the age of 3, most oncologists will seek to avoid the use of radiation entirely if at all possible. For some older children, the life-saving benefits of radiation therapy may outweigh the small risk of developing a spinal cord tumor or other secondary cancer. Can spinal cord tumors be prevented? When facing the devastating diagnosis of a childhood spinal cord tumor, parents often need to know if there is anything they could have done differently to prevent their child from developing cancer. The answer can be both frustrating and reassuring. Spinal cord tumors are nearly always the result of random gene mutations and can neither be predicted nor prevented. The one exception may be, as noted above, the use of radiation to treat another type of cancer; however, in these rare cases, the choice to use radiation therapy was likely the best possible—and maybe the only—option to fight that cancer and save the child’s life. The brain and the spinal cord make up what is known as the Central Nervous System (CNS) and together, they control nearly all of our body’s normal functions. The brain is composed of three major parts. 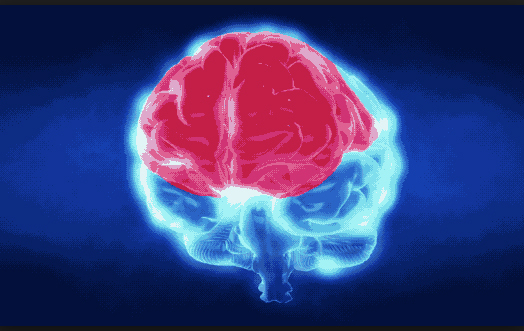 The cerebrum controls thinking, emotions, speech, learning, problem solving, and voluntary movement. The cerebellum controls movement, balance, and posture. The brain stem connects the brain to the spinal cord. It is responsible for autonomic functions such as breathing and heart rate, as well as the muscles and nerves that enable us to see, hear, walk, talk, and eat. The spinal cord is the delicate column of nerve tissues contained within the “back bone”, the collection of vertebrae that protect the nerves. These nerves carry the critical messages between the brain and the body that enable the body to function normally and properly. A spinal cord tumor is a growth of abnormal cells within the spinal cord. A tumor forms as cells grow and/or replicate too quickly, or do not die at the correct time. 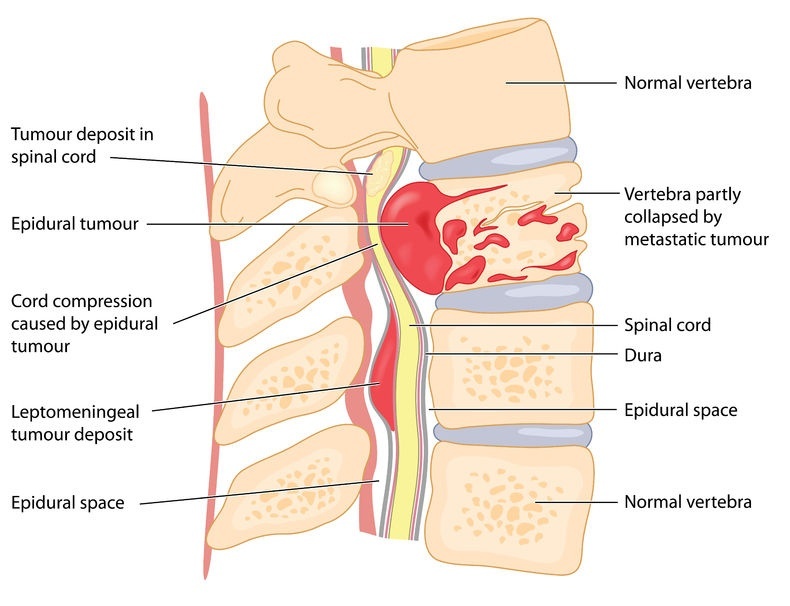 The tumor may be either malignant (cancerous) or benign (non-cancerous); however, this distinction is less critical when dealing with spinal cord tumors because both types of tumors can—as they grow—press on and constrict the healthy tissues of the spinal cord and impede their normal functioning. Thus, both benign and malignant tumors can cause similar types of symptoms. 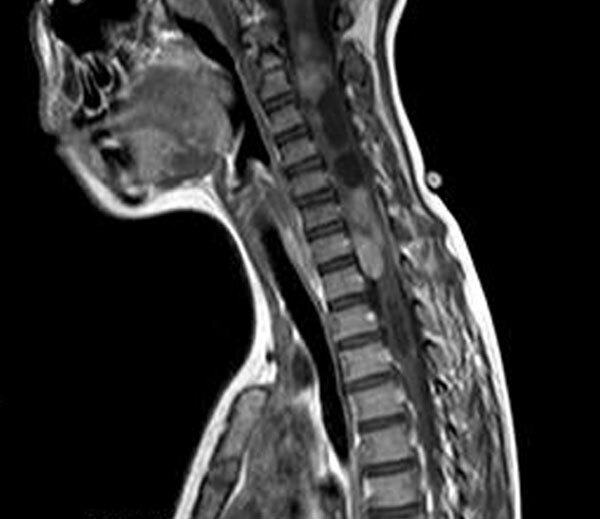 Usually, detection and diagnosis of a spinal cord tumor occurs only after a child begins to show unusual symptoms indicating a potential health concern. If you are concerned that your child is displaying these or other unusual symptoms, it is important that you take him or her to your pediatrician right away. Spinal cord tumors in children are very rare, and in many cases these or other symptoms may be caused by a simple childhood illness. However, if your child’s pediatrician suspects the presence of a tumor, he or she will refer you to a neurologist and/or an oncologist for additional testing to ensure a prompt and accurate diagnosis. A neurological exam: this will check your child’s mental status, coordination, and ability to walk, talk, and function normally. It may involve a series of questions and/or physical tests—depending on the age and developmental status of the child—to check brain, nerve, and spinal cord function. Imaging exam: Physical and neurological exams will help determine if there is a health risk but will not provide any accurate diagnosis. In most cases, your child’s neurologist or oncologist will follow up all neurological exams with an imaging exam, which is the first step in detecting and locating an actual tumor. The most common imaging test is an MRI with gadolinium (also called nuclear magnetic resonance imaging). When injected near the site of the suspected tumor, the gadolinium collects near the abnormal cells, causing them to show up brighter in the image. Blood tests: Along with imaging tests, blood tests can indicate the presence of “tumor markers”, or abnormal substances in the blood caused by certain types of cancers. Whenever possible, final diagnosis will occur during and after surgery to remove all or part of the spinal cord tumor. The goal of surgery is to remove all of the tumor, or as much of it as possible. A pathologist will then examine a piece of the tumor under a microscope to diagnose the type and grade of the tumor. This diagnosis will determine the course of follow-up treatment to kill any remaining tumorous cells and hopefully prevent the tumor from re-growing. In some cases, however, the tumor may be growing in an area of the spinal cord where it cannot be removed surgically without causing excess damage to nearby healthy tissue. In these cases, diagnosis will be made based on imaging alone, and a non-surgical course of treatment will be determined based on that diagnosis. 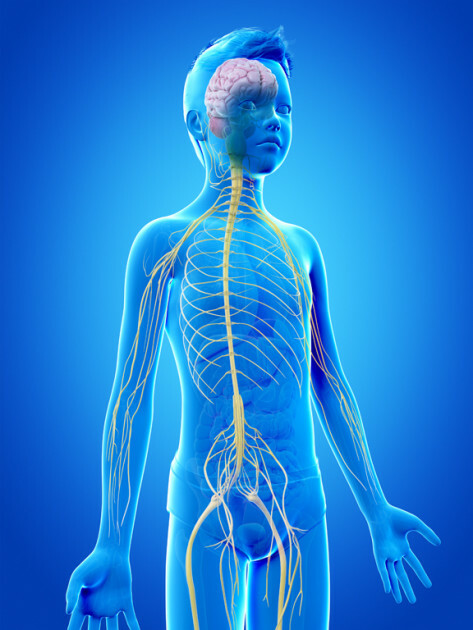 The central nervous system—including the brain and the spinal cord—grows and develops very quickly during childhood. This rapid rate of growth and development can make treating a brain and/or spinal cord tumor in children especially complicated for several reasons. First, the growth of the tumor can more easily damage the rapidly-changing tissues of the central nervous system (CNS). Second, the tissues of the CNS are extremely sensitive to the potentially damaging impact of chemotherapy, radiation, and other tools required to eliminate the tumor. These two issues are especially concerning when discussing survivorship issues for childhood brain and spinal cord tumors, and may have repercussions well into adulthood. How do we cope with the effects of the tumor and its treatment? Once your child’s treatment is complete and your child has been declared “cancer free”, most families are eager to return to “normal life”. Yet this sense of well-being and even excitement can be undermined by concerns about whether the tumor will return. The best way to alleviate these concerns—and enable yourself to enjoy a cancer-free life with your family—is to develop A Survivorship Care Plan. This Care Plan will carefully detail all the necessary follow-up scans and tests needed to monitor your child for any possible return of the tumor, as well as detect and manage potential late effects. Although many families note an increased level of anxiety around follow-up visits, it is important to stick to the schedule of follow-up visits and exams as dictated by your child’s oncology team. These visits will likely include imaging tests such as CT scans or MRIs, physical exams, blood work and other tests to monitor your child’s short- and long-term recovery and watch closely for signs that the tumor may be re-growing. Your child’s specific schedule of follow-up testing will depend heavily on the type and location of the tumor and the type and duration of treatment; for instance, children who underwent radiation may require routine scans and follow-up visits for many years after treatment because of the elevated risk for secondary cancers. Both the tumor and the treatment required to fight the tumor can have significant physical, emotional, and mental side effects, depending on the type of tumor and where, and how big, it grew before treatment. Some of these side effects may be very obvious, some may be much more subtle; some side effects may appear immediately, while others may not occur until years after treatment. Once your child has been declared cancer-free, your medical team will work together to determine the extent of damage to the brain and central nervous system and to analyze the potential effects of that damage. Neurologist: A specialist in the central nervous system who can help identify and manage side effects relating to physical coordination, muscle strength, and seizures. Ophthalmologist: A specialist in eye problems for handling any issues relating to vision. Audiologist: A specialist who can address any issues relating to hearing. A speech therapist: A speech therapist can address any issues your child may be experiencing with talking and communicating. Physical and/or occupational therapists: Experts who can provide physical therapy to overcome muscle weakness, paralysis, or difficulty walking, balancing, and other movement-related concerns. Psychiatrist or psychologist: A mental-health professional can be extremely helpful in diagnosing and documenting developmental concerns, especially relating to general intelligence, speech and hearing, memory, learning skills, and special educational needs. Endocrinologist: An expert in hormone disorders who can help side effects relating to growth, hormone imbalances, and future reproductive issues. This type of specialist will be especially important for children with a tumor in or near the brain stem (at the base of the brain) or near the pituitary gland. What is the expected life span of Childhood Brain Tumor Cancer? “What is my child’s prognosis?” This seemingly simple but critical question is often among the first that parents will ask their child’s oncologist after hearing that their child has been diagnosed with cancer. Yet while the question may be simple, answering it can be extremely complicated. In general terms, oncologists can provide statistics relating to 5-year survival rates for many different types of brain tumors in children. These general statistics, however, cannot predict an outcome for any one child. Each child’s individual prognosis will depend on the unique circumstances of their tumor and its response to treatment. What are the key prognosis factors for childhood brain tumors? Unlike many other forms of cancer, brain tumors rarely spread to areas of the body outside the central nervous system. Instead, brain tumors can be life-threatening because of the damage they can inflict on the delicate and highly critical tissues of the brain and spinal cord. For this reason, doctors do not use two prognosis factors commonly used when discussing other types of childhood cancers: benign v. malignant and “staging”. Based on information from the Central Brain Tumor Registry of the United States (covering children treated between 1995 and 2010), we can provide five-year survival rates for some of the most common types of brain tumors diagnosed in children. As noted above, however, it is important to remember that these statistics do not accurately represent the chances of long-term survival for any one specific child. 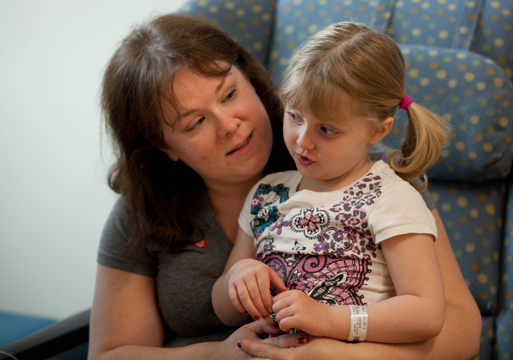 What are the Signs and Symptoms of Brain Tumors in Children? When classed together in a single grouping, cancers in the brain and spinal cord are the second most common type of childhood cancer after leukemia. Brain and spinal cord tumors account for about 25% of all childhood cancer diagnoses, with more than 4,000 new cases diagnosed every year in the United States. 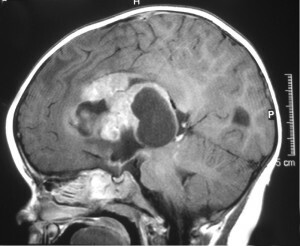 In reality, however, it can be difficult to discuss “brain tumors” in general terms: oncologists recognize at least nine different sub-classifications of brain tumors in children, such as brain stem gliomas and ependymomas for example, with still more sub-groupings within those broad classifications. Moreover, it is important to note at the outset that a variety of factors can impact both the initial indicators of the tumor’s presence, as well as the appropriate course of treatment, factors such as: the tumor’s location in the brain, the size of the tumor, how quickly the tumor is growing, and for treatment purposes, whether the tumor can be removed surgically. Interestingly enough, the one distinction that oncologists do not make regarding brain tumors in children is whether the tumor is benign (non-cancerous) or malignant (cancerous). Because brain tumors occur in such a vital and sensitive area of the body, both types of tumors can be life-threatening. Of course, many of these concerns are symptoms of common childhood illness and may not be related to a tumor. However, should these symptoms persist and/or worsen over time, your pediatrician may recommend a visit to a neurologist or oncologist to conduct diagnostic testing. One potential symptom—seizures—can develop both rapidly and unexpectedly. Should your child begin experiencing seizures, it is important to seek medical help immediately from a neurologist who can help determine if a tumor is causing the seizures. In older children, guardians and teachers may notice unusual fatigue, personality changes, or a decline in performance or attitude at school. Cerebrum (large, outer part of the brain): may cause weakness or numbness in a specific part of the body, usually only on one side; speech or comprehension problems; concerns about thinking, personality, and language skills; issues with vision. Again, it is important to note that brain tumors in children are extremely rare and even if you notice your child exhibiting one or more of these symptoms, it does not necessarily mean that your child has a brain tumor. These symptoms can be caused by a wide range of different medical issues. However, it is important that you speak to your pediatrician about your concerns. He or she will refer you to the appropriate specialist in order to ensure that your child gets an accurate diagnosis and treatment as quickly as possible. Why do some children develop brain tumors? Any time a child is diagnosed with a brain tumor or other type of cancer, the most obvious question many parents ask is “why”. What caused this child to develop a brain tumor? Unfortunately, there is no easy answer to this question. Scientists now believe that the vast majority of brain tumors in children are the result of random gene mutations but have no satisfying answer as to why a particular gene mutation occurred or why it led to the growth of a brain tumor. Whether benign or malignant, a tumor grows when certain cells grow, divide, and replicate more quickly than normal cells and/or they do not die when they are aged or damaged. These abnormal cells then begin to build up in the brain, forming clumps or a mass, and eventually growing large enough to press on or cause damage to the healthy brain tissue. So why do some cells grow, function, and die normally, while others grow abnormally and develop into a brain tumor? Scientists currently believe that these abnormal cells are the result of mutations (random changes) within the DNA in each cell. Mutations in oncogenes inhibit when cells grow and divide properly, while mutations in tumor suppressor genes prevent cells from slowing their rate of replication and prevent them from dying at the proper time. Because mutations are a natural part of the lifecycle of our cells—occurring frequently as our cells grow and divide over time—preventing or predicting these mutations is currently impossible. What are the risk factors for brain tumors in children? Radiation exposure: Exposure to large amounts of radiation has been linked to several types of cancer, including brain tumors in children. While low-level radiation exposure is an accepted aspect of today’s medical care (x-rays, for instance, for dental treatment or to diagnose a broken bone), the medical community goes to great lengths to protect children from high dosages of radiation exposure. However, radiation therapy has proven to be an effective tool when fighting some types of cancer. While most oncologists will limit or avoid altogether the use of radiation when treating very young children, in some cases, the benefits of treating the immediate threat posed by cancer must be weighed against the potential risk of developing a brain tumor or other secondary cancer in the future. Can we do anything to prevent a brain tumor? Unfortunately, all too many parents—after hearing that their child has been diagnosed with a brain tumor—feel an overwhelming sense of guilt. Many wonder whether this diagnosis is somehow their fault, or whether they might have been able to do something to prevent this diagnosis. However, any oncologist will assure these parents that there is absolutely nothing they could have done to prevent their child from developing a brain tumor. 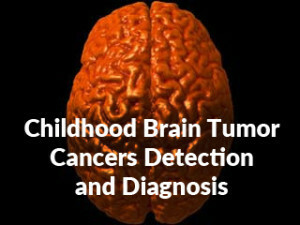 Brain tumors in children are not believed to be linked to any environmental factors or lifestyle choices (with the notable exception of radiation exposure noted above); instead, they are most likely the result of random and uncontrollable gene mutations. After leukemia, brain tumors (including spinal cord tumors) are the second-most common type of cancer in children, accounting for about 25% of all childhood cancer diagnoses. Brain tumors begin within the delicate and complicated tissues of the brain or the cerebrospinal fluid (as well as the spinal cord or central nervous system, as these tumors are usually classed with brain tumors in children). When dealing with brain tumors in children, oncologists rarely differentiate between benign (non-cancerous) or malignant (cancerous) tumors; all tumors in the brain can be life-threatening whether technically cancerous or not. Instead, oncologists usually focus on how fast the tumor is growing, how quickly or easily it may spread throughout the brain or spinal cord, and how easy the tumor is to remove completely. Gliomas: a general term for a group of tumors that begin in the supporting cells of the brain. 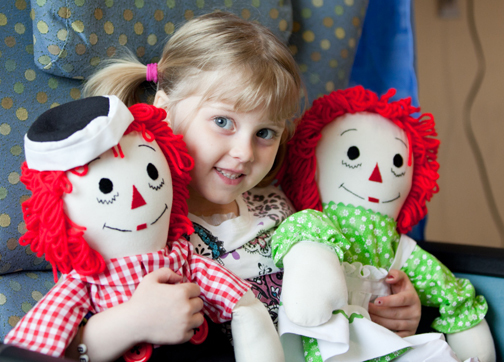 Gliomas account for about 50% of all brain and spinal cord tumors in children. Examples include astrocytomas, oligodendrogliomas, ependymomas, optic gliomas, and brain stem gliomas. Brain stem gliomas themselves account for about 10-20% of all brain tumors in children. Because they often grow diffusely throughout the brain stem, “diffuse midline gliomas” (such as diffuse intrinsic pontine gliomas, or DIPGs) remain very difficult to treat. Embryonal tumors: accounting for about 10-20% of all brain tumors in children, embryonal tumors usually begin in the earliest forms of nerve cells and therefore are more common in younger children. The most common type is medulloblastoma, but other forms of embryonal tumors include medulloepithelioma, atypical teratoid/rhabdoid tumor, and embryonal tumor with multilayered rosettes. Pineal tumors: these tumors begin in a small gland in the middle of the brain—the pineal gland—and are very difficult to treat. The most common type of pineal tumors are pineoblastomas. Craniopharyngiomas: about 4% of all brain tumors in children are these slow-growing tumors which begin between the pituitary gland and the brain itself. Because they often press on the pituitary gland, the hypothalamus, and/or the optic nerves, they can be very difficult to remove without impacting the child’s vision and/or hormone balance. Mixed glial and neuronal tumors: these types of tumors, including dysembryoplastic neuroepithelial tumors and gangliogliomas, are generally slow-growing and have a fairly good prognosis when treated with surgery and potentially radiation. Unfortunately, as with all childhood cancers, there is no way to “detect” a brain tumor without formal diagnostic testing. In most cases, detection and diagnosis happens only after parents, guardians, teachers, or others close to the child start observing unusual medical symptoms such as frequent headaches, nausea and vomiting, vision problems, balance problems, or seizures. Because many of these symptoms are commonplace, a pediatrician may only suspect a tumor if symptoms continue over time or worsen, or in the case of seizures appear very suddenly. Should your child’s pediatrician suspect the presence of a brain tumor, he or she will recommend a visit to a specialist, who will conduct a series of diagnostic tests to determine if a brain tumor is present. The first diagnostic test is almost always an imaging test, usually an MRI. Using a combination of radio waves and strong magnets, an MRI can create a series of detailed images of the brain without involving radiation (which is extremely damaging to the delicate brain tissue of children, especially young children). While an MRI or other imaging test can indicate the presence of a tumor or other abnormality, a final diagnosis usually must be made through a biopsy. A biopsy involves removing some or all of the tumorous tissue and examining it under a microscope. In some cases, a biopsy may be done simultaneously with surgery to remove the entire tumor, or it may involving only removing a piece in order to determine the appropriate course of treatment. However, in some cases, the tumor may be located in such a sensitive or difficult-to-reach area of the brain, that a physical biopsy is not possible; in these cases, diagnosis must be made on the results of imaging tests. Once the biopsy has confirmed the presence of tumor and identified its type and grade, your child’s oncology team will work with you to determine the best course of treatment for your child.